I have found a new movie to obsess over!!! 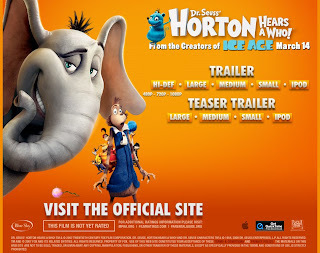 Tonight I went to see the very heavily promoted 'Horton Hears a Who' based on the original book by Dr. Seuss and I have to admit- it was really great!!! "I can't fight this feeling anymore, I've forgotten what I started fighting for...."
Awesome cast, wonderfully well done- there were a ton of inside jokes that I managed to catch- like the Mayor's pet fish looks exactly like the fish from 'The Cat in the Hat' or '1 Fish, 2 Fish' and when the Mayor is addressing all the townspeople, I noticed a character standing to the side with a plate of green eggs and ham! If you have children, know any children or ever were a child yourself, GO SEE THIS MOVIE! Dr. Seuss is classic; after seeing Horton Hears a Who i was reminded how much that guy can pack into a simple storyline... they didn't add much to the original story either except for the usual Jim Carreyisms.